The annual rendezvous, where trappers for the fur trade companies, the free-trappers, and various Indian tribes would gather to exchange their year-long labor's worth of furs for much-needed, desired goods from the east and from the south, was held on the Green River near present-day Pinedale, Wyoming, six times during the rendezvous period of 1825 to 1840. Many items were brought from St. Louis, and also from Mexico, to be traded for beaver pelts and other furs; this also included blankets, many kinds of cloth, cotton shirts, kettles, dry goods, and various iron items. In addition, there were other standard items such as lead and black powder and, of course, whiskey. I researched and discovered that parasols, or umbrellas, were greatly treasured by the Native Americans, and they appeared in the area by the latter years of the fur trade. The idea that parasols could be in this setting intrigued me. 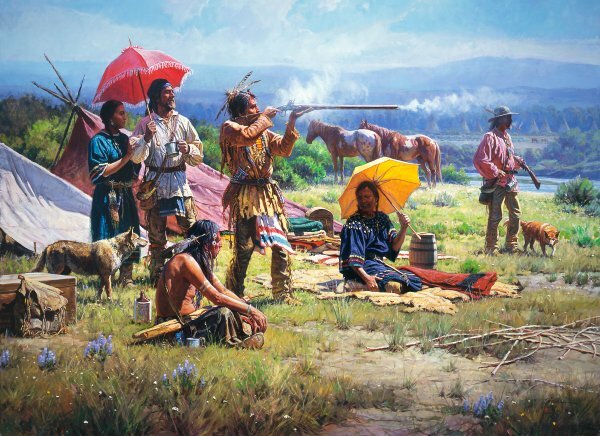 I decided to paint a typical situation at a rendezvous - an Indian trying out a flintlock trade gun near one of the many encampments on the Green River and the Horse Creek, but with the addition of the colorful, delicate parasols. For me, it is a blending of extremes - the fanciful parasols in the midst of this rowdy, annual event of the Rocky Mountain West.